As Barack Obama nears the end of his sometimes good, sometimes not-so-good two terms as president, he is developing a healthy case of senioritis. This is good for us, because chill Obama is definitely my best, coolest friend. 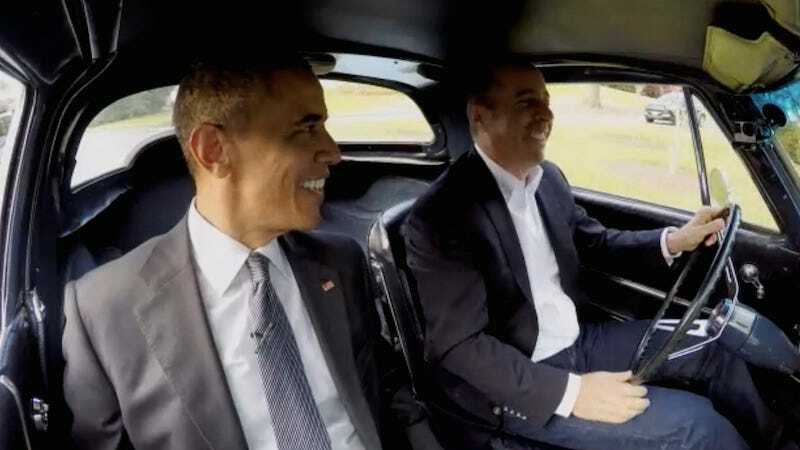 On Thursday, a mysterious content source called Crackle released the premiere of the seventh season of Jerry Seinfeld’s Comedians in Cars Getting Coffee, in which Seinfeld gets coffee in a 1963 Corvette Stingray with amateur comedian Barack Obama. The reunion reads like two friends from high school (who are now both grotesquely rich and powerful) having a cute reunion. “What’s your most embarrassing moment?” Seinfeld asks at one point. “This may be it,” Obama confesses, before eventually sneaking in a plug for Obamacare.